Recipe created by Super Fan Kris Miller using our Golden Turmeric Spice tea blend. Spicy chicken/shrimp curry with anti-inflaitory turmeric and ginger give this meal not only a kick but also an immune boosting flare. Chicken/Shrimp are the perfect match for a great curry sauce and basmati rice. 1Sautee onion, garlic, ginger, cayenne pepper with oil of choice in a 2 quart pot until soft. During this time follow directions on package for cooking brown basmati rice. 2Add 2 TBLS to 1/4 C. St. Fiacre's Farm Golden Turmeric Spice Tea in a sachet or cheese cloth bundle tied with twine. Add to pot. 3Add Coconut Milk to pot with 2 c. of Bone Broth to pot. Bring to a boil. 4Reduce to medium-med. low and simmer. Simmer 15 minutes if using tea in a sachet. 5Cube chicken breasts and add to liquid. Cover and poach in liquid until cooked through to 165 degrees. 6Add 2-4 cups mixed raw veggies to liquid, cook until desired tenderness. 7Add juice of one lime as well as salt and pepper to taste. 8Serve meat, veggies and sauce over rice and enjoy! 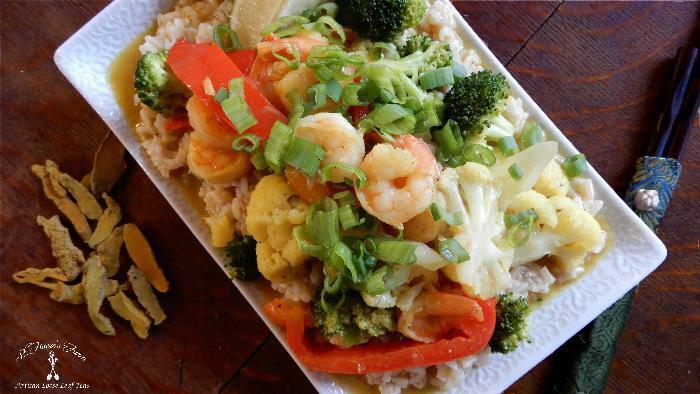 This may be made with just chicken, just shrimp or a combo of both. Or even sub in tofu or other meat!